Have you ever counted the number of steps you take in 24 hours? On an average, a person takes about 1200 steps when he walks 1 km. If you go for a 5 km walk, you would have taken around 6000 steps. Additionally, the daily chores might add another 2000 steps approximately. Some years ago, I used a pedometer to find out how many steps I would take on a day with a morning walk and another day without a morning walk. The first number was quite good - more than 9000 steps - but the second number dropped drastically! A study shows that Americans cover around 5000 steps per day and this could be one of the reasons for weight problems and low fitness. 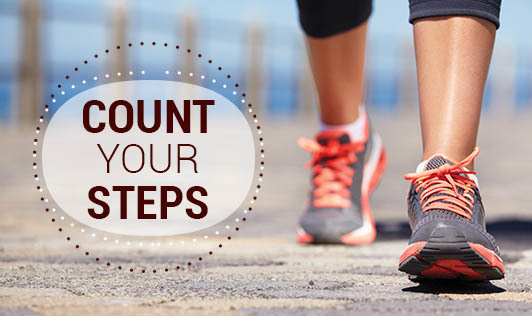 For good health and fitness you need to cover around 9000 to 10000 steps per day. So, get up and move more!